Antony Cummins is a name that many new to the Samurai and Ninja martial arts become familiar with quite quickly. 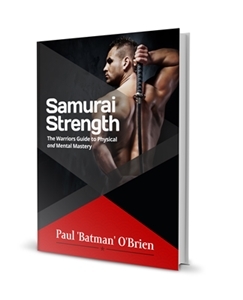 He is a published author on several volumes of Ninjutsu lore and history and has published translations of several Japanese texts relating to the feudal Japanese Ninja and Samurai. He also runs a successful Youtube channel, where he provides near daily in depth video discussions on various aspects of Japanese martial culture and opinion pieces along with a variety of instructional videos. To Antony Cummins credit, he is a well educated man, with a degree in Ancient History and Archaeology and a Masters Degree in Archaeology, via the Victoria University of Manchester. Further he has appeared in a variety of documentaries including those of NHK and the History Channel. He has many fans and supporters of his videos, publications and of course a school of martial arts he is attempting to recreate called Natori-ryu. As such, many see him as he presents himself, an authority figure, historian and researcher, who is providing genuine facts concealed or previously misunderstood about the ninja, samurai and koryu bujutsu (old martial arts schools). He presents himself as a man who risks ridicule and scorn in his unbending quest for the truth, whose only wish is to unite everyone, and can't understand why people won't cooperate with him and accept his truth. As a result, on the internet at least, Cummins has positioned himself as a character of controversy, a sound tactic for attracting attention and views to his videos and publications, as seen by the success of President Donald J. Trump, who used a similar tactic to great effect. In a similar vein to President Trump, Cummins makes volatile and often inflammatory statements in his videos which attract the attention of the legitimate martial arts community. The reaction then further fuels the persecution Cummins experiences and provides legitimate evidence to his supporters of Cummins claims. I have no interest in Antony Cummins; I have never met him and wish him no ill will, but I don't particularly want to contribute to his view counts or promote him in an fashion, which perhaps raises some curiosity as to why I am writing this article? Why am I writing about Cummins? Fundametally, as I'll cover in part 2 - Antony Cummics is DANGEROUS. He represents a REAL risk for causing injury and through that represents a significant risk and danger to the continued practice of the martial arts here in Ireland. In part 3 - Antony Cummins is not a Martial arts Teacher, I'll continue and show you how he systematically demonstrates his lack of understanding in the martial arts and how he is making deliberate false claims for his personal and financial gain. All of this is reason enough, but I have another one. I get a LOT of email about him. Asking is this (insert claim/statement here) accurate? Is X true? Why do you say A, when he says Z? This has risen dramatically since Cummins began speaking less about the ninja and has started speaking more about the samurai, specifically the koryu and within that Iai and Niten Ichi ryu, in his efforts to promote his latest books and the Natori Ryu school he is engaged in rebuilding. I have received enough of these emails that I feel at this stage it is easier to have a series of FAQ articles on the matter that I can simply link to rather than dealing with every complaint and query individually. I have no doubt that over time as this continues I shall have to revisit and update this discussion with more specific Antony Cummins fact checks so feel free to check back periodically. With that, let's begin with Part 1 - Why Antony Cummins is a fraud. Firstly I want to establish that there are a lot of people who watch and read Cummins material and get genuine value from it. If that helps bring people into the smaller world of the koryu and the genuine teachings I am happy. I worry however, that experience to Cummins misinformation will be taken as a primary source on information and colour the new students view, either consciously or unconsciously to the actual facts, history, beliefs, techniques and lifestyles of feudal Japanese warriors. 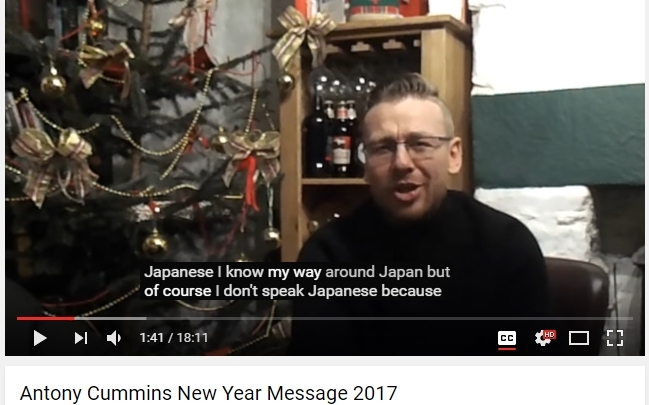 Unfortunately, there are many out there who don't have access to the Japanese language, original sources and respected teachers and a such must rely solely on English language sources for their understanding. And this means they rely on unscrupulous individuals such as Cummins who take advantage of that enthusiasm and interest. Recently I was discussing this with just such a interested student. 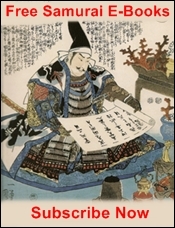 They are intelligent, enthusiastic and eager to learn more about authentic samurai arts and history and they cited two works by Cummins as an example of his good work. And in fact it was this discussion that promoted my final decision to publish this article and continuing FAQ. "Samurai War Stories: Teachings and Tales of Samurai Warfare" by Anthony Cummins and Yoshie Minami is billed as, "The first English translation of 17th-century Japanese Samurai works which have never been out of print in Japan since printing was invented". One may take it as a simple translation of a series of texts. However this is not so straight forward and not a product of Cummins work or knowledge and highlights one of my primary problems with his methods. Antony Cummins does not speak or read Japanese. Cummins does not speak or read Japanese. He acknowledges this. He does however have a team, primarily Yoshie Minami who translates the Japanese text into English. 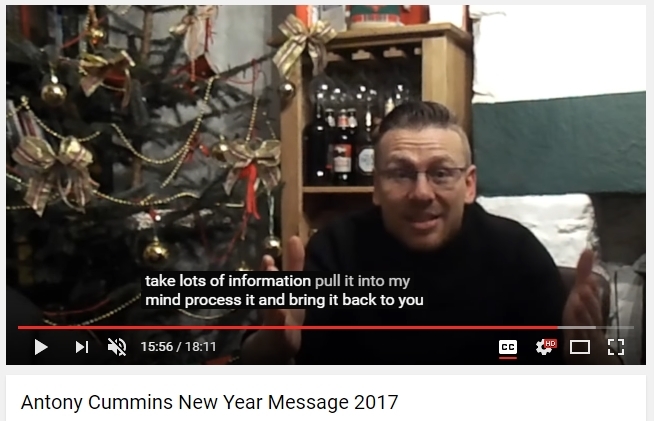 And this is where Cummins comes in - he discusses this in several of his videos - he reads what she has translated and changes it, to flow better, sound better and injects his own interpretation into the text. That is a problem. Because then the work he produces, such as Samurai War Stories is not a translation of the texts he is claiming to present - it's his interpretation of someone elses. Japanese is very tricky to translate - I've written an article on just this topic. Basically Japanese is a pictographic language - there is NO DEFINITIVE method of translating those pictures into specific English or Romanised letters. In addition you have to preserving the meaning of the source text, know as "semantic invariance". Cummins dismisses this in favour of his opinion on what it should be, not what it is. Finally, we need to look at the structure (structural invariance) - where we have a great deal of confusion...not to mention attempts to map each individual word to its English equivalent accurately (lexical invariance). This is Cummins primary focus, to take what was written and make it sound good to western ears. This is of course very different from an accurate translation. Please understand that what you read in Cummins work is about as accurate as to the source text as the hilarious game of translating the names of movies in English to Chinese, via Google and then that back into English. "Ghostbusters" in China translates to "Super Powered Dare Team"". In Japan Leaving Las Vega is "Your Drunk and I'm a Prostitute". "As Good as it Gets", comes out in China as "Mr. Cat Poop". Which is perhaps the most fitting example of Cummins style of "work". "Just sometimes, especially me, I get caught up on some of the terminology, cause they don't translate it, they just leave it in situ [my note: he is referring to a name here. A name.] So we got this first bit here, which is the name of a person...or a god if you will, it's like a god, a god's name, so basically it's like....em....'this really great holy dude', that's the Antony Cummins translation". - Antony Cummins, Natori Ryu Seminar - Winter 2016, 31:24 - 31:49, via Youtube. Cummins bills himself as a "historical researcher", asking questions and exposing unpleasant truths. Which is all well and good, I have no problem with that, if that is what was happening (spoiler warning, it's not). Cummins states you have to have ALL of these aspects to have a clear picture of history and rates Living traditions as the lowest and least important (which is ironic as he is trying to recreate a dead ryu - from a book - which must, if still extant traditions are low value, a dead ryu must be valued ever even lower right? - and I'll come back to this one shortly). Cummins is correct in his assertion that from true historical context and research care and attention must be paid to each of these aspects. But he doesn't care for them, and in fact conducts himself in the manner that he rails against. So with that in mind, lets look at Cummins according to his own criteria. Has he conducted, investigated research into the archaeological evidence?Kind of. He's certainly seen it, been to Japan a few times and seen some museums and shrines.But that is not investigative research, rather Cummins has a habit for taking the absence of evidence as confirmation of fact. His videos on the museum at Iga are a good example. 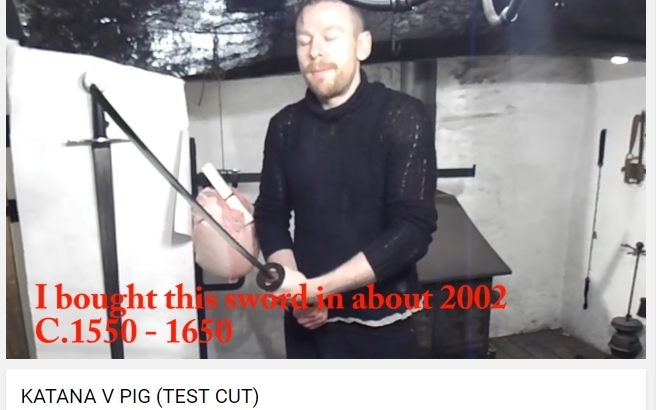 He collects scrolls, that is true, and antique weaponry but he can't read the scrolls and his respect for antiquity can be seriously questioned considering he demonstrated "test cutting" by slicing ham with a 500 year old sword. One of the key factors in engaging in serious academic research and even good amatuer research is to be able to read the language of the primary source material. Cummins cannot do this, which we covered above. This fundamentally makes his claim of adhering to documentation falsehood. Regardless of his claims he is not reading PRIMARY sources, he is, and I am being generous here, reading the "translations" he has been given by his research team. This still counts as primary source, but the quality of translation is questionable. Further as noted, he doesn't even accept these, instead, and I am paraphrasing here, "putting them into his head and mixing it all up and pulling out the simple truths contained in them and sharing that". That product it not historical research, that is bad ham fisted fan fiction. It is one man's misinformed opinion. "I obviously don't speak Japanese, what i do have is the ability to take lots of information pull it in to my mind, process and bring it back to you guys..."
"Reading primary sources isn't easy.....You also need to think carefully about what kinds of assumptions and beliefs you bring to your reading of a document. You need to make sure that your own person and political opinions don't prejudice the way in which you read the document". Antony's many videos and discussions openly discuss that he fails to do this, that he does not recognize this an issue. This greatly undermines any credible claim on his part of legitimate research. Images/Iconography are important, but must be understood within context. 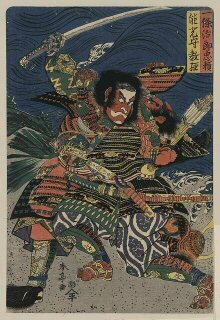 I am fortunate to own a number of beautiful woodblock prints, formerly from her Majesty's collection. I also have a number of scrolls, with some beautiful images of Marishiten and Tengu upon them. They are excellent and insightful but no more accurate of what happened than comic books are today. While Reagan certainly was US President, I don't think he strolled through the lawn of the White House with Superman ordering him to break Batman like an unruly horse. Many Japanese images are of myth, legends, and portraits of popular theatre actors and performances. Within the scrolls, the images and texts nearly always feature called "damasare", where the text is vague or illusory, only making sense to those initiated in the techniques and knowledge. 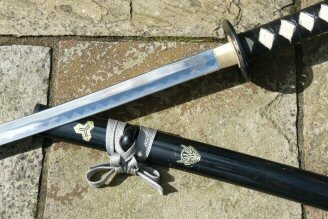 There is an excellent article on the subject here - Damasare written by the excellent martial arts author, Wayne Murumoto. Sadly Cummins, often uses this to twist the meaning, words and context of what he finds to suit himself, for instance, implying that aspects of the Go Rin no Sho regarding posture, could in fact be a lie, which justifies his bizarre and inefficient bowed back crouching stances. (See his terrible Katana V Pig video for more on that exact issue). Rather than applying academic rigour, and finding the truth as he claims, Cummins takes that which supports his views and dismisses what he doesn't like in both text and images. Cummins is not a member of any recognized ryu-ha. He is not a member of any living tradition. He cites this as an advantage as he does not get blinded by the "rose tinted glasses of koryu schools" and it allows him to be objective. Which is all well and good, but that's neither accurate nor it is part of the historical sciences methodology. Cummins is now trying to resurrect/create a school of martial arts from a book. A book I remind you he cannot read and relies upon others translations. 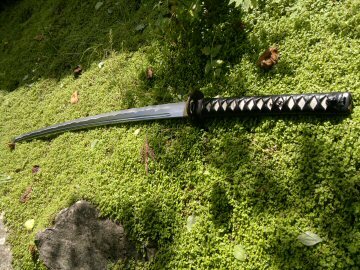 And he does so without cultural context and historical context and his body has not be conditioned in the Japanese manner, as those who follow Natori ryu in the past naturally would have. 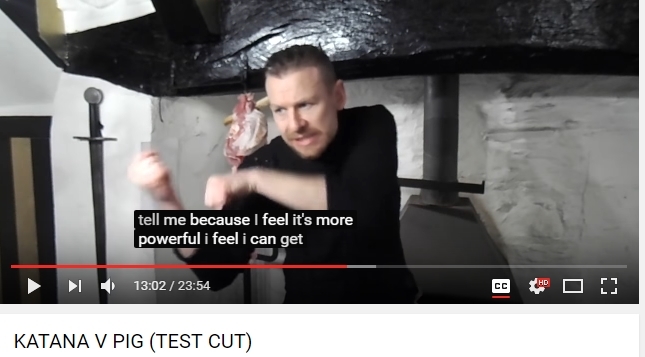 As Ellis Amdur, koryu teacher, author and psychologist explains, a KEY aspect of the study of any Japanese ryu, martial or otherwise is how if affects the mind. This psychological organisation is achieved through physical organisation of the ryu- without proper physical training in the art one cannot understand the context, mindset, and physiology of the art. As such it is fundamentally impossible for Cummins to resurrect a dead school with any degree of accuracy. For more on this I highly recommend Amdur's articles on, "Renovation and Innovation in Koryū", found in Keiko Shokon: Classical Warrior Traditions of Japan, volume 3, Ed. Diane Skoss, published by Koryu Books. "...we not only lack the experience of teachers who have used these archaic weapons in mortal combat, because our bodies simply lack the physicality of strength and flexibility of a pre-industrial society. A man who walks and rides horses as his only means of transportation; who chops his own wood and works in a barefoot crouch for hours at a time, simply has a different musculature, a different plasticity to his tendons then a modern man who works at a desk. The kata were designed for the former man, where literally every waking moment was preparation of the body in a way that we can only mimic with supplemental exercise today. Let me put it this way: You want to join a koryū ? Prepare to not only work hard, but to be bored while you are doing it. It comes with the territory"
I feel this quote, taken from an excellent interview promoting the 2nd Edition of Old School - an incredibly good text on Samurai thought, combat and history, perfectly sums up Antony's disdain for living traditions and his desire to recreate the Natori ryu. 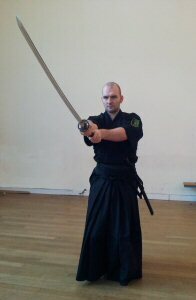 In doing so, Antony can, engage, "in samurai live-action role-play", and avoid the hard work and physical conditioning and organisation that comes with training in an actual living tradition. 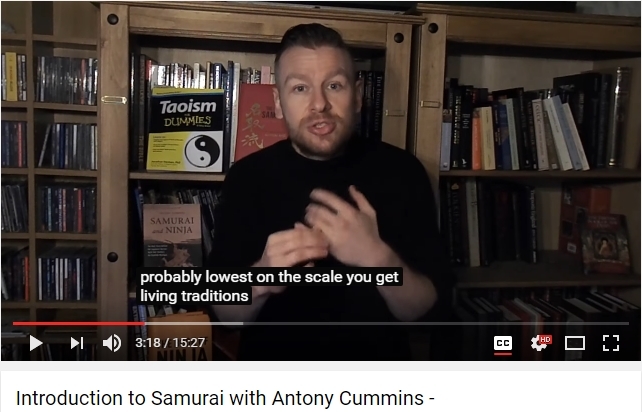 As Antony Cummins states quite clearly in his video on Samurai history, you need all four components, including the study of a living tradition - which he categorically is not doing. 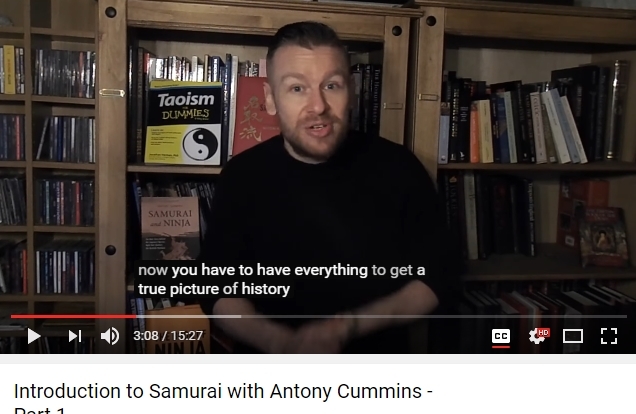 Cummins ably demonstrates his lack of understanding of living traditions and koryu in his many videos, but perhaps clearest of all is during his "teaching" of of Miyamoto Musashi's style. I'll cover this in detail in a later entry, but he bases his movements from a secondary and dubious translation of the text, then imports his own ideas into creating what I can only call bizarre movements, and speaks with an authority that is utterly unjustified. He is without any context. Archaeological Investigation - which he demonstrates disrespect and false conclusions of. Living traditions / Anthropology which he does not study and actively dismisses, choosing to invent his own. "Peer review means that a manuscript or research proposal will be read and evaluated by other scholars with expertise in the time period, subject matter, languages, and documents with which the author deals. As peers of the author in a specialized field, these reviewers provide analysis to the review boards of agencies on the scholarly significance of the article: Does the author display knowledge of existing work in the field? Does the research design, processes and methodologies, for example, conform with professional standards? Does the author advance an original argument and provide valid evidence to support the work? If particular areas are weak or absent in the presentation, the peer reviewers suggest revisions that will strengthen the project and call for resubmission before funding is awarded or a manuscript is accepted for publication". "100% of the people that have a problem with the historical research team...and the work we do are all attatched to an organisation of some form. If they are a member of a koryu...they always have a problem". - Antony Cummins Antony Cummins New Year Message 2017 via Youtube. 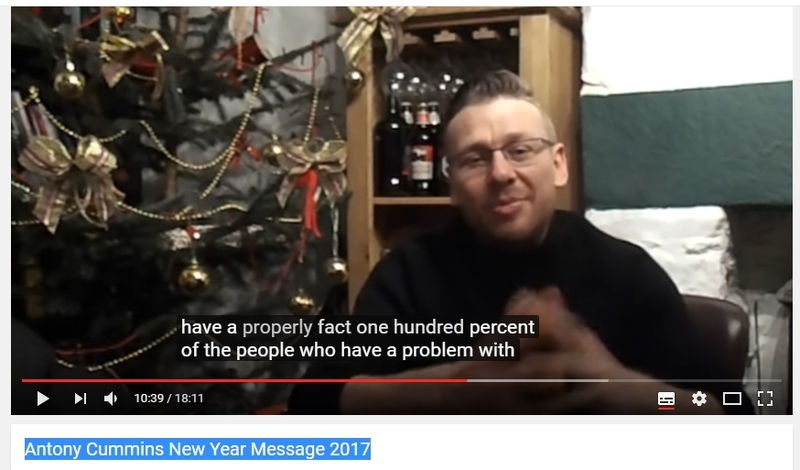 100% of those with a problem are students of recognized koryu schools according to Antony Cummins, source, YouTube. Thus we can see clearly that any claims to genuine research and accuracy on the part of Cummins are little more than phrases to explain a man, wrapping his Cosplay and LARPing in the trappings of legitimacy. I have no problem with LARPing, or Cosplay but to label it historical research is misleading and Cummins defrauds the unsuspecting and uninformed public of their money and more importantly their irreplaceable time. "a person or thing intended to deceive others, typically by unjustifiably claiming or being credited with accomplishments or qualities." Cummins commits fraud in deceiving others by claiming credit and accomplishment in a field he has no academic qualifications in and for things he simply has not done. Cummins presents himself to the public, via his books and videos as a ""historical researcher". However, as established in the article, he is not. He dismisses, falsifies, and willfully misinterprets the actual historical facts, has no ability to read or interpret the subject matter he is discussing and has been largely dismissed by the actual academic community. Presenting himself as, and claiming to be a "historical researcher" is a fundamentally fraudulent claim. "wrongful or criminal deception intended to result in financial or personal gain". This is a more serious aspect of fraud and it is the actual books he sells (and now the made up school he sells membership of) for financial and personal gain (this is covered in detail in part 3). These books are sold under a false premise that they are accurate translations. As shown in my article they are not - and are 1) translated by other people 2) Cummins is not capable of reliable interpretation of those translated passages as he demonstrates in his various videos and covered in detail in Part 2. The books are not factual. The books are not accurate. The school he has created is based on multiple inaccurate and easily demonstrated, misinterpretations. Neither the books or the school meet the academic criteria for either. The evidence and facts are, as demonstrated, that Cummins is engaged in presenting false information and a false narrative both of himself and his material for financial gain. What would you call someone who unjustifiably claims credit for accomplishments and qualities that they do not possess and uses these to deceive for financial and personal gain? I would call them a fraud. Legacies of the Sword: The Kashima-Shinryu and Samurai Martial Culture - Friday, Karl F. University of Hawaii Press, 1997.